What is Facts are Facts? 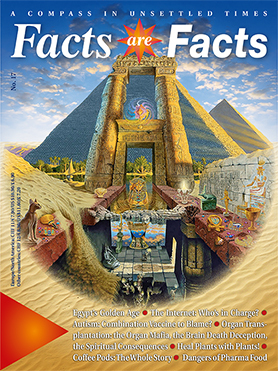 A quarterly magazine where you can read everything the mass media doesn’t want you to: news of the latest political developments; in-depth articles on the true laws of nature; our ‘prescriptions’ for mankind and our planet; glimpses into the invisible world of the spirit. Everyone who wants to know. Everyone who wants to act. Everyone who has the feeling that something’s not quite right with the world, and who doesn’t want to have the wool pulled over their eyes anymore. At anyone open to a higher law. Anyone who dreams of a better world, and believes we can make it happen. At everyone who is ready to believe that every single human being has the power to make the world a better place – and who wants to be one of those people! Who are we not aimed at? Anyone who sticks their head in the sand and believes that as long as they don’t think about a problem, it will go away. Materialists for whom existence is just an unfortunate accident in a chaotic universe. The ice-cold cynic. The professional pessimist. The guy who believes everything he reads in the papers. The nihilist. Everyone who thinks that you can’t change anything, and even if you could, life isn’t worth living anyway. How is Facts are Facts different from other magazines? In almost every way! First of all, this is no pessimistic political pamphlet, fallen prey to conspiracy hysteria (though we don’t deny that there is a ‘conspiracy’). Secondly, this is not an unworldly booklet of esoterica, preaching love, peace, and incense sticks, and closing its eyes to what needs to be changed in the world. Thirdly, Facts are Facts is not a New Age supermarket, offering a thousand and one paths to enlightenment. 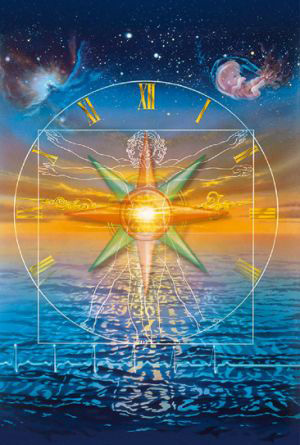 Probably the starkest difference between Facts are Facts and other magazines is that the topics it covers are those based on the spiritual and natural laws that the Age of Aquarius enables mankind to recognise again. We don’t ask questions about why and how, we give you the facts that answer those questions. That can mean the facts on the world of politics, the natural laws of the vortex, Man’s seven bodies, or the true form of the Earth. Hence Facts are Facts’s subtitle: “A compass in troubled times”. Facts are Facts should be a compass that helps show us all the way to a more harmonic, more responsible, and therefore more fulfilling life, in accord with both the material and spiritual worlds. Who’s behind Facts are Facts? Ursula and Benjamin Seiler-Spielmann, two Swiss journalists who in 1993 finally had enough of being forced to write negative stories in the traditional media, stories designed to demoralise and put nothing constructive towards making the world a better place. They knew that the mass media wouldn’t touch the topics they knew from their personal research and investigations. Today, Facts are Facts already has tens of thousands of readers from across the world.